Three murderers who went to any lengths to satisfy their greed. Dorothy Puente, Michael Abdul Malik and acid bath slayer John Haigh all killed for cash. 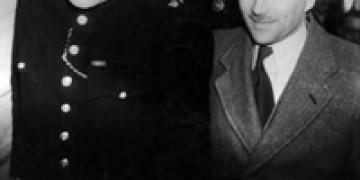 One of the most bizarre and disturbing cases of mass murder is that committed by John Haigh, a respectable, well dressed, middle-class man with a surfeit of charm who, in the late 1940s, disposed of at least six victims in a manner that led some to label him a vampire. Haigh’s motivations for his crimes, which involved luring his prey to a fate where their blood was consumed before being dissolved in acid, have never been clearly corroborated. His claim to have been disturbed in his childhood by his strict religious parents, leading to a psychotic state of mind obsessed with religious iconography and sacrificial fantasies, has been disputed. Critics believe that instead of insanity fuelling Haigh’s vampire-like activities, he was in fact a cold-hearted killer who arrogantly believed that where there was no body, there was no crime to pin on him. John George Haigh was born on 24 July 1909 in Stamford, Lincolnshire. The family moved to Outwood, West Yorkshire, where Haigh spent the next 24 years of his life. He was brought up in a fanatically religious household where references to ‘the Lord’ were used frequently to remind the young Haigh that he was always observed by a higher and disapproving deity. Haigh himself claimed that his childhood was bleak and lonely. His only friends were his few pets and caring for the neighbour’s dog. A tall fence around the house, put up by his father, kept out prying eyes or any social contact with the outside world. Haigh’s parents belonged to a religious sect known as the Plymouth Brethren, who were purist and anticlerical. Bible stories were the only form of entertainment. Even participating in sports of any kind was forbidden. According to Haigh Snr, the world was ‘evil’ and the family needed to keep themselves separate. As his father had also told him that the blue blemish on his own head had been the result of him ‘sinning’ in his youth, it is perhaps not surprising that the young Haigh became obsessed and terrified by developing a similar ‘sign of the devil’ due to the slightest misdemeanour. He was told that his mother had no ‘mark’ as she was an angel. It is said that a turning point in the boy’s developing psyche came when Haigh realised that no such blemish would appear, despite having lied or committed some other questionable behaviour. He then started to believe that he was invincible and could get away with anything. Claims of being afflicted by dreams of Gothic, nightmarish proportions, where trees would turn into crucifixes weeping blood, have to be viewed with caution. Haigh was later known to be manipulative and a compulsive liar, prone to saying anything to extricate himself from a compromising position. At the time of his arrest for murder, his personal enquiries into what may befall him if he was found to be insane, is an indication that Haigh was aware that appearing ‘bonkers’ and damaged by his childhood would possibly work in his favour when it came to court. In 1934 Haigh stopped attending his parents' church and married Beatrice Hammer, a 21-year-old woman he barely knew. Despite having been impressed by Haigh’s manners and charm, she was uncertain about his character but still went ahead with the marriage on 6 July 1934. Haigh's parents allowed the couple to live with them although the marriage lasted only about four months, ending when Haigh was arrested in October 1934 and sent to prison for fraud. While he was incarcerated, Beatrice gave birth to a baby daughter, whom she gave up for adoption. Haigh saw her only once more; briefly, to lie by telling her that they were never officially wed because he already had a wife at the time. Despite his abilities Haigh spent a considerable amount of time in prison for mainly fraudulent practices that involved various illegal enterprises. During a brief period he worked at an amusement park run by a Mr William ‘Mac’ Donald McSwan and his parents Donald McSwan and wife Amy. The family liked Haigh, promoted him in the business and were sorry to see him leave when he decided he wanted glittering prizes elsewhere. His next project, involving setting up a false solicitor’s office, earned him four years in prison. It was while he was incarcerated that he thought up a new scheme to become rich quickly, instead of toiling for a living. His plan was simply to go after rich, older women. Haigh had also convinced himself that if there was no corpse, then there could be no conviction. Such a belief no doubt prompted him into working with sulphuric acid in the prison's tin shop where he experimented on mice and made studies of the effects of acid on animal tissue. After Haigh was released from prison, he set out to carry his heinous plan. In the interim he stayed with the Stephen family, beginning a close friendship with one of the daughters, Barbara, who, despite the 20-year age gap, believed that she could become the next Mrs Haigh. In 1944 Haigh was involved in a car accident where he suffered a wound to the head, which bled into his mouth. He later referred to this event as having been the catalyst that reawakened his blood-filled nightmares. Shortly afterwards he rented a basement space at 79 Gloucester Road, where he set up his ‘workshop’, a grim death trap to lure unsuspecting victims.